Sona and Uttara to Suvannabhumi ( Modern Raichur Gulbarga), Mahadeva to Mahisamandala (modern Mysore), Maha Dharaiarukkhita to Maharattha (Lata area of Maharastra from where Rastrakuta originate), Itakkhita to Vanavasi (Banvasi, Karnataka) and Dhammarakkhita to Aparanta (Konkan area of Maharastra). Apart from the famous Sannati Stupa, excavations near Banavasi in 1971 revealed stupas and bricks that have been dated to the 2nd and 3rd century BC. A Intact Buddhist deepasthambha (lamp post) of those times was found at the village Togarsi near Banavasi. Sannati stands as a significant cluster of dozens of Buddhist relics, which include two stupas, three mounds, one fortification, four major rock edicts and more than 75 contemporary inscriptions, all scattered across a compact area of about ten square kilometres. Sannati is also physically closer to the known Buddhist sites at Ter in Maharashtra and Nagarjuna Konda in Andhra Pradesh. Portions of Major Rock edicts 13 and 14 were found and separate rock edicts 1 & 2 were found in Sannati. The Sannati Edict puts back the question that Mauryan Empire is a single state. Until sannati was found Mauryan empire was considered a single state with Kalinga accorded special status , but Sannati has the same content as kalinga edict that puts two special states – which is not special. This puts the clarity on ashokan administration. Country is centralised with high degree of autonomy to states. The local kannada dynasty Satakarni's (satavahana), which immediately followed Ashoka rule followed similar administration. Highly decentralised administration with each area under a governer or military commander, many areas enjoying autonomy at the same time protection of the big empire. BRAHMAGIRI (Minor Rock Inscription 1 & 2). Excavations at the site have revealed considerable archaeological evidence pointing to Brahmagiri having been an important centre in south India well before the Mauryan period. Continual habitation for many thousands of years resulted in its emerging as an influential town, particularly after it had become one of the southern outposts of the Mauryan empire. Brahmagiri is located in the Chitradurga district. The site was first explored by Benjamin L. Rice in 1891, who discovered rock edicts of Emperor Ashoka here. These rock edicts indicated that the locality was termed as Isila and denoted a part of the Mauryan empire. The Brahmagiri site is a granite outcrop elevated about 180 m. above the surrounding plains and measures around 500 m east-west and 100 m north-south. It is well known for the large amount of megalithic monuments that have been found here. The earliest settlement found here has been dated to before 2000 BC. M. H. Krishna who belonged to the Archaeological Department of the Mysore state, excavated the area in 1940. In 1947, Mortimer Wheeler further excavated the site on behalf of the Archaeological Survey of India. The region was excavated again in 1956 by Seshadri and by Amalananda Ghosh in 1965 and 1978. During his excavations, M. H. Krishna discovered medieval stone temples, pottery, terracota beads and figurines, semiprecious stones and megalithic structures. After digging 16 trenches he identified the following cultures: Microlithic, Neolithic, Iron Age, Maurya and Chalukya, Hoysala. He named the microlithic culture as Roppa culture after the Roppa village within which the microlithic trench was located. He also found out that the neoliths found in this region were evidence of the occupation of this region by farming-herding communities in the pre-megalithic period. In 1947, Mortimer Wheeler did further excavations at Brahmagiri, found ten domestic structures and classified them as belonging to a sequence of three cultural periods: Period I - Neolithic , Neolithic-Chalcolithic, Period II - Megalithic and Period III - an early historical culture. 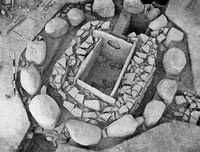 Brahmagiri was identified to contain a mortuary of 300 tombs with burials made in rectangular cists, cist-circles (stones surrounding granite cists) and pit-circles. The cists also included artefacts like vessels with graffiti, stone beads and iron and copper tools. We need further studies on graffiti etched on them. Brahmagiri is the ancient site of Ishila, one of emperor Ashoka's provincial capitals. His earliest rock edicts in Brahmi script and Prakrit language (3rd c. BC) containing Kannada word. This is the earliest known word of kannada (and also first word in a language other than prakrit, Aramic and Greek) in an inscription in India. K A Nilakantha Sastri, said that the Brahmagiri site, near Ashoka Siddapura, “is remarkable for its culture continuity extending from the polished stone axe culture to early historic cultures.” He also said that there were two phases of the stone axe culture here (known from a study of the pottery found here)., and that the authors of this culture knew how to use Neolithic celts, microliths, and how to work copper and bronze. The French Institute of Pondicherry, has published a Historical atlas of South India. If we superimpose the maps of the Stone Age, the New Stone Age and the Iron (Megalithic Age), we can see that Brahmagiri region had a continuous human civilization for more than 5,000 years. N Kameswara Rao of the Indian Institute of Astrophysics, Bangalore, has published a research paper in which he said that the megalithic stone circles at Brahmagiri, which have been dated at 900 BC show clear astronomical orientation. The geometrical properties of the circle indicate the sunrise and the full moon rise at the time of solar and lunar solsitices and equinoxes. “The megalithic people were aware of the 18.61 period of the moon's solstice, in addition to keeping track of the sidereal day, the seasons and the year. Bricks built caityas have been excavated in Brahmagiri 1942 and again in 1947, There is no evidence to date the caitya, thogh the brick sizes are similar to those from Dharanikota. A comparison with similar structures from the north is revealing. Which shows a strong scientific link between north India and Karnataka since ancient times. SIDDAPUR (Minor Rock Inscription 1 & 2). GAVIMATH (Minor Rock Edict 1). GaviMath is near Koppal ,about 60 miles from Siddapura ,between Hospet and Gadag Railway Junctions. The Inscription was discoved by N.B. Sastri in 1931. He discovered both Gavimath and Palkigundu Inscriptions. Both Inscriptions are identical and represent another version of inscription found in slightly different form at Rupanath, Sashasram, Bairat(Closest to Gavimath version), Brahmagiri, Siddapura, Jatinga- Ramesvara, maski and Yerragudi. The Gavimath version is the most legible version of the all the inscriptions mentioned above. Which gives a very clear details and rests all the other confusions in reading the above inscriptions. This site lies about three miles from Brahmagiri and the inscription belongs to the Mysore group. It might originally have been a place of religious interest since the inscription is within the precincts of the present Jatinga-Rameshwar temple. Maski is in the Raichur district. It lies on the bank of the Maski river which is a tributary of the Tungabhadra. 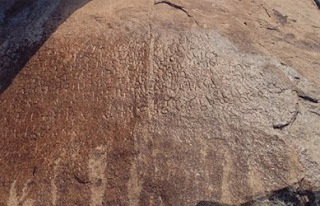 SUVARNAGIRI (Minor Rock Edict I). Suvarnagiri is the modern town of Kanakagiri south of Maski The word suvarnagiri means 'golden mountain' and this has been connected with the ancient gold-mining area in Raichur which to this day shows traces of ancient gold workings. The Identification of Swarnabhoomi with karnataka is confirmed by this edict. PALKIGUNDU (Minor Rock Edict 1). Palkigundu lies at a distance of four miles from Gavimath. This site again belongs to the group around Brahmagiri. Maski was studied initially by Robert Bruce Foote in 1870 and 1888. 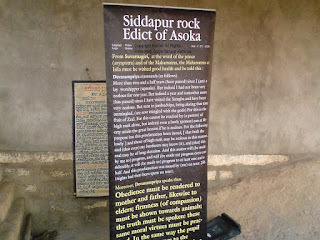 In 1915, C. Beadon, a mining engineer, discovered Ashoka's rock edict here. In 1935-37, the archaeological department of Hyderabad explored this region and in 1954, Amalananda Ghosh excavated this place on behalf of the Archaeological Survey of India. The excavations indicated that the region was occupied across four different cultural periods; Period I: Neolithic-Chalcolithic, Period II: Megalithic, Period III: Early historical and Period IV: Medieval. In Period I, microliths and blades made of agate, chert, carnelian and opal are found. Ornamental beads of agate, coral, shell and other materials are also found. Dull-grey ware and painted-buff ware pottery are found, some of which were painted with linear patterns. Animal remains of cattle, buffalo, sheep and goat are also found. Period II saw the introduction of iron and five different forms of burials were discovered. Lances, ferrules, daggers and arrowheads were found, apart from beads of gold and terracotta objects. The pottery of Period II consisted of the megalithic red-and-black ware, all-black ware and red-slipped ware, some of which had graffiti on them. Coins were discovered in the Period III which also saw the use of Russet-coated painted ware. The earliest specimens of Indian glass were also discovered at Maski. A cylinder seal has also been found here. Maski inscription is Important Inscription in three ways , first it was the first inscription to give both Priyadarshan and Ashoka , thus identifying Ashoka with Priyadarshin found in other edicts. Third the Earliest specimen of Glass. Which shows karnataka was the pioneer of high technology in India not just now but also in ancient times as well. Udeogolam is in Shiraguppa Taluk Bellary District. Nittur is in Shiraguppa Taluk Bellary District. "Mahalake hi vijitam" ('Vast is my empire'), proclaims Ashoka, but how extensive really was his dominion in the West? In the Nittur Edict he explicitly calls himself the king of Pathavi - an unmistakable allusion to Parthia or Parthava of the Achaemenian records. Writers like Romila Thapar attempt to explain this away by suggesting that Pathavi corresponds to Prithvi, or the Earth, and that the statement only demonstrates royal vainglory. A world emperor like Ashoka who sent missionaries to kings of many other parts of the Earth surely was not so foolish as to call himself the ruler of the Earth. The Edict shows he is also ruler of parthia (Persia – Modern Iran). This explains the wide contact between Karnataka and Persia since arliest times. If you are amazed by significance of karnata with Ashoka , then you will lose your breadth if you hear about this one. Kanaganahalli is about 3km from Sannati. An important Buddhist site, the place where an ancient Buddhist Mahastupa site was found. It is on the left bank of the Bhima river in Chitapur taluk, Gulbarga District in North Karnataka. Nalwar is the nearest Railway station about 19 km from Kanaganahalli. The Buddhist site about 2.5 km from Chandrala Parameshwari temple of Sannati. In the autumn of 1993, a team of acheologists was surveying the area around sannati in the chitapur taluk of Gulbarga district. A dam was to be built across the river Bhima near this place, and the survey was necessary for the mandatory environment clearance, several sites were discovered in the course of the survey, but the most dramatic evidence came from kanaganahalli. This site is situated on the left bank of the Bhima river , 2km east of chandralamba temple at sannati, Here some irregular stones arranged in arc in the midst of agricultural fields attracted the attention of the archeologists. Trial excavations in 1994-95 under the direction of K.P. Poonacha revealed one eighth of a large brick stupa encased with sculpted limestone slabs , carved limestone slabs, pillars, railings, capitals, and sculptures were unearthed. Over 60 lead coins bearing the names of satavahana kings, and 200 donative and label inscriptions were identified. The remains of the kanaganahalli stupa is also known as mahachaitya. The discoveries a the site included a broken relief sculpture showing a king and queen flanked by female attendents two of whom held up a parasol and fly whisk – symbols of sovereignty – in their hands. An Inscription in Brahmi read “Ranyo Ashoka”(King Ashoka) leaving no doubt who the central figure was supposed to represent. Many years earlier a relief panel at the central indian site of sanchi has been identified as representation of the same king, but there no inscription to confirm the identification. Later after kanaganahalli was found same sculpture with same inscription was found in orissa also, confirming the identity of the person in sculpure to be Ashoka. Kanaganahalli provided an image that could definitely be connected to one of the most famous kings of ancient India. 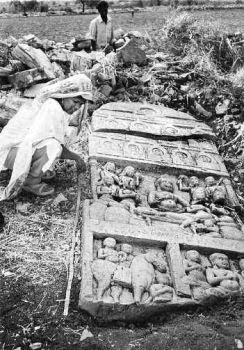 Trial excavations at kanaganahalli were followed by more systematic ones in 1996-97. The report of these excavations contains a wealth of important material illustrating the history of Buddhism in Karnataka especially upper krishna valley. The Sannati Edict puts back the question that Mauryan Empire is a single state. Until sannati was found Mauryan empire was considered a single state with Kalinga accorded special status , but Sannati has the same content as kalinga edict that puts two special states – which is not special. This puts the clarity on ashokan administration. Country is centralised with high degree of autonomy to states. Brahmagiri is the ancient site of Ishila, one of emperor Ashoka's provincial capitals. His earliest rock edicts in Brahmi script and Prakrit language (3rd c. BC) containing Kannada word. This is the earliest known word of kannada (and also first word in a language other than prakrit, Aramic and Greek in India) in an inscription in India. Maski inscription was the first inscription to give both Priyadarshan and Ashoka , thus identifying Ashoka with Priyadarshin found in other edicts. Maski site reveals , Earliest specimens of Glass. Which shows karnataka was the pioneer of high technology in India not just now but also in ancient times as well. The Gavimath version is the most legible version of the all the inscriptions mentioned above. Which gives a very clear details and rests all the other confusions in reading the inscriptions elsewhere in India. Nittur Inscription reveals persia (Iran) was under Ashoka Rule. Which significantly increases the extend of Indian Empire. Kanaganahalli provides the stone Images of Ashoka. Megalithic stone circles at Brahmagiri with astronomical orientation, which have been dated at 900 BC, show Aryabhatta , Bhaskara ,Mahavira ,virasena, and line of mathematicians are carriers of legacy since ancient times. 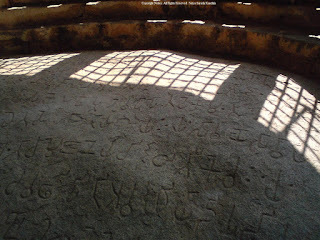 The Inscriptions also prove that Karnataka was a major business destination since ancient times. I am YERRISWAMY.G.V, thanking you for providing valuable information and i am searching history of ASHOKA SIDDAPURA but i couldn't found anywhere in the NET or in your website, so i request in you people to add some history. 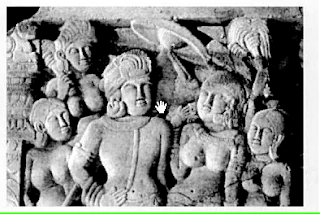 in one picture in http://www.svabhinava.org/hinducivilization/dialogues/SexualityFemaleBody_files/image018.jpg the statue was not broken. but now it is broken. may be recently.